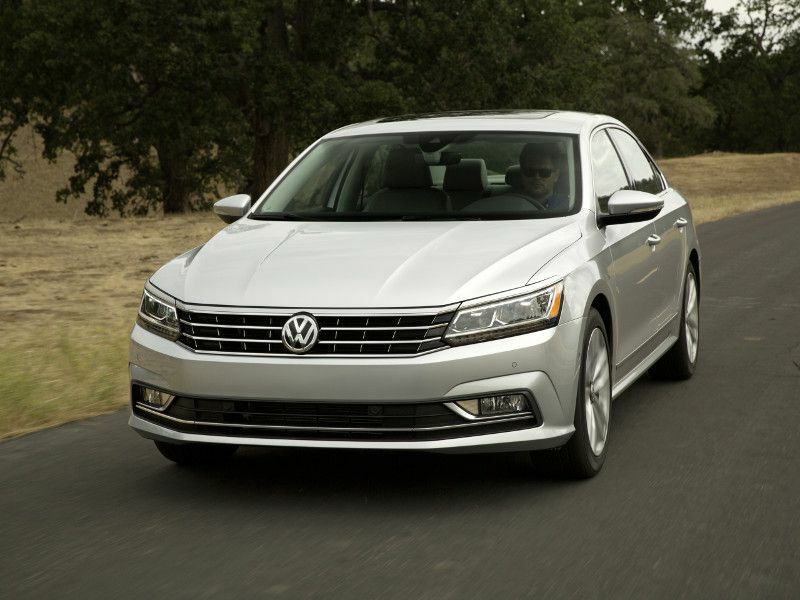 The Volkswagen Passat is a mid-size sedan with plenty of appeal. It comes in with a low starting price and offers a range of comfort, safety, and infotainment features to please every buyer. This year, it also gets a new turbocharged engine to improve the driving experience. The Passat has a roomy cabin that’s comfortable for even large adults and a spacious trunk to carry along all your cargo. 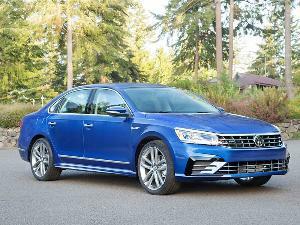 Let’s take a closer look at the 2018 Volkswagen Passat and see if it’s the right mid-size sedan for you. 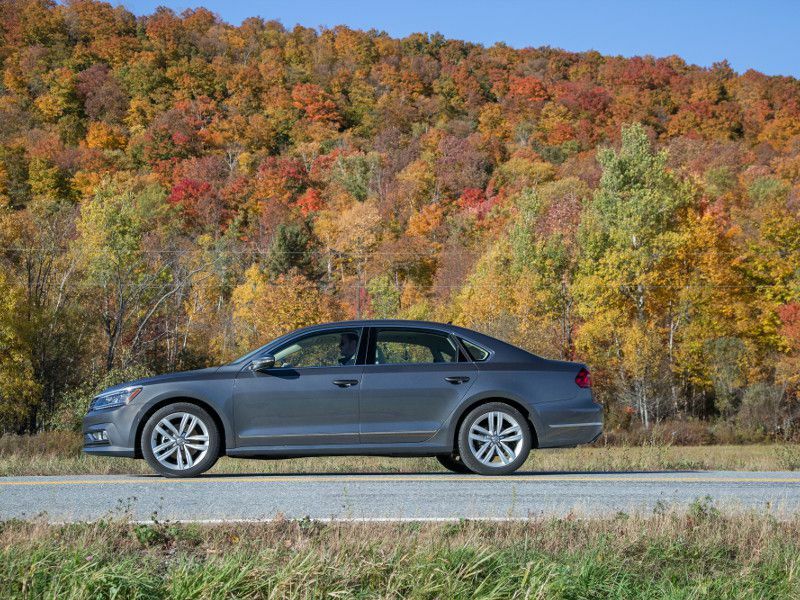 There are six Passat trim levels, starting with the base S priced at $22,995. Next is the R-Line with unique styling elements including 19-inch wheels, unique interior trims, and sill plates. It also adds heated seats, and a leather-wrapped steering wheel with paddle shifters, starting at $24,995. The SE starts at $26,295 and adds a power sunroof, keyless access with push-button start, and a larger 6.3-inch infotainment touchscreen. The SE with Technology trim is priced from $29,595 with LED headlights, taillights, and daytime running lights; heated rear seats; and remote start. The SEL Premium sees pricing climb to $31,650 with standard features including leather seats, footwell lighting, and ambient lighting. Also standard are a lane-departure warning, park distance control, and parking steering assist, which aren’t available at all on lower trims. At the top is the SEL V6 Premium at $34,650, which is the only trim with a V6 engine. The big news with the 2018 Passat is its new powertrain. All but the top trim now has a turbocharged 2.0-liter four-cylinder with 174 horsepower and 184 lb-ft of torque, paired to a six-speed automatic transmission. It’s a more powerful and more responsive engine than the one it replaces, making the Passat nicer to drive. It can easily merge into highway traffic with smooth, quiet transmission shifts that don’t intrude into the cabin. Those who crave a more spirited ride will find it in the SEL Premium V6, which makes a big jump to 280 horsepower and 258 lb-ft of torque. That power makes a noticeable difference in how the Passat drives. Unfortunately, this engine isn’t available, not even as an option, on any of the other trims. 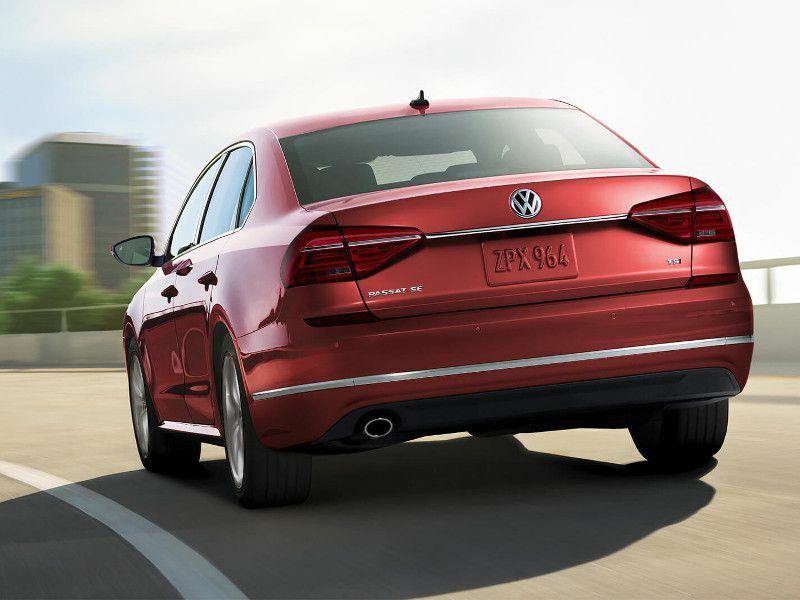 The Passat is an affordable family sedan and part of its affordability comes from its fuel economy. Gas prices can always rise, and it can be tough on your budget. The new 2.0-liter four-cylinder engine does very well with an EPA-estimated 26 mpg in the city, 36 mpg on the highway, and 29 mpg combined. If you choose to go with the more powerful V6 engine available only on the top trim level, then those numbers take a big dip. 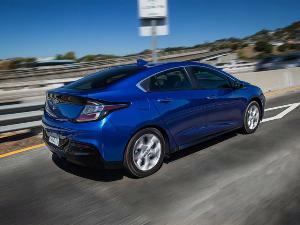 The V6 engine gets an EPA-estimated 19 mpg in the city, 28 mpg on the highway, and 22 mpg combined. That’s a much more expensive proposition, especially if you’re planning on using the Passat as a commuter car. 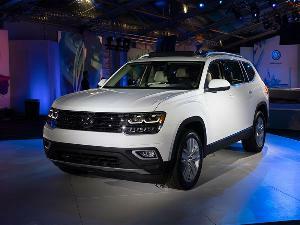 Adding to its cost is Volkswagen's recommendation to use premium fuel for optimum performance. If fuel economy is a priority, think carefully before you go with the V6 engine. 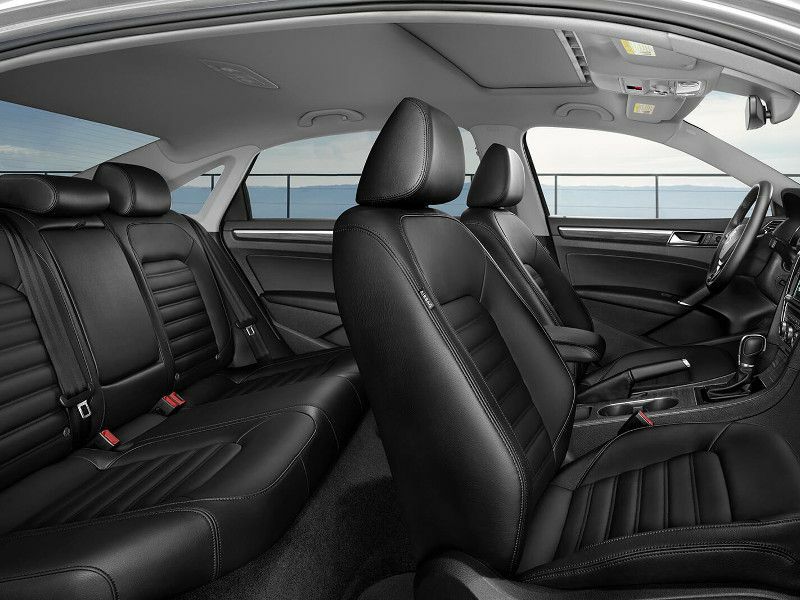 The Passat offers a relaxing ride for passengers no matter where they sit. Its suspension system is tuned to smooth out rough road surfaces, and it easily absorbs the shock of unseen potholes. One of the big reasons to buy a sedan is for its passenger comfort and the Passat delivers with an excellent ride quality. That comfort extends to the Passat’s handling. This is not a sports car that demands the driver to constantly adjust to every change in the road surface. 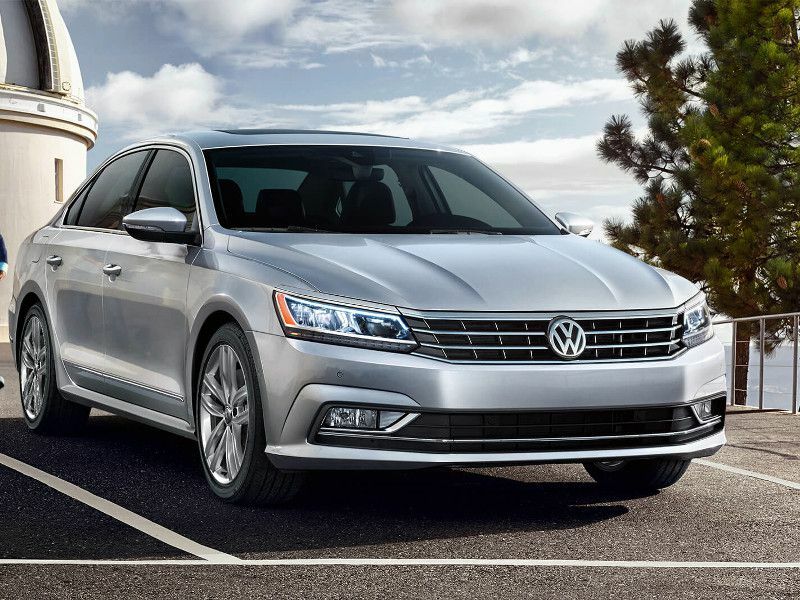 Instead, the Passat offers more relaxed handling that doesn’t need too much driver input. It’s responsive but not taxing, so the driver remains confidently in control at all times. This is ideal for those family road trips and long commutes that get tiring in the best of circumstances. One area where the Passat excels is passenger room. This is an expansive cabin for a mid-size sedan with plenty of room for five adults and comfortable seats. As usual, the rear seats are best for two, but three can still sit back there without being half on top of each other. Even pushing the front seats back won’t smash the knees of rear-seat passengers. 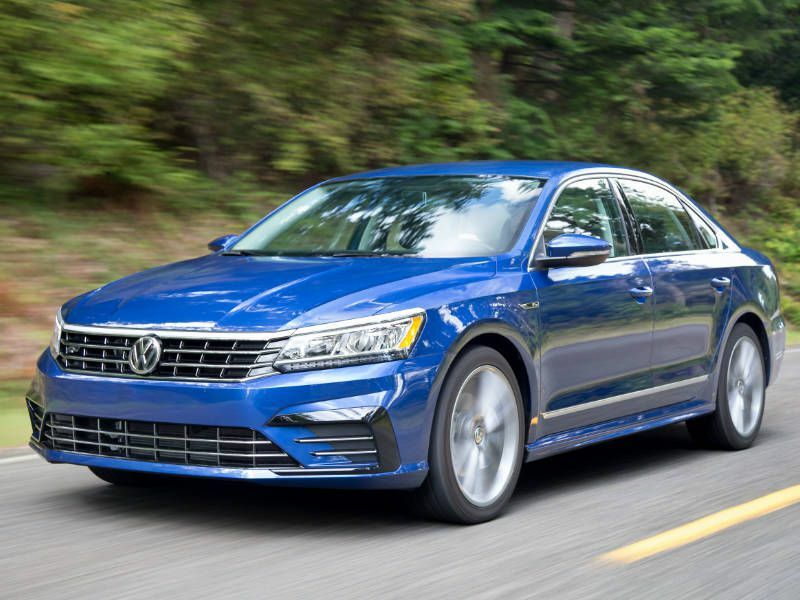 When it comes to quality and appearance, the story varies depending on the trim you choose, but even in the top trim the Passat still feels like an economy car. There are lots of plastics that are unappealing on lower trims, but they do improve with varying colors and textures by the time you get to the SEL Premium. Cloth seating surfaces look and feel durable. Stepping up to leather seats, meanwhile, ups the Passat’s appeal significantly. crossovers are the rage these days because they offer the perfect balance between cargo and people, but that doesn’t mean sedans can’t do the job, too. There are times when sedan owners need room for cargo, especially when it comes time for family vacations, and the Passat is up to the challenge. It starts with a rear-seat pass-through that lets two people sit in the back while longer items from the trunk can sneak through between them. That trunk has an impressive 15.9 cubic feet of cargo room, so it easily holds the family’s luggage and then some. If there are no rear passengers, then the rear seat split-folds 60/40 to fit larger items that need a little more room than the trunk allows. The Passat isn’t a cargo hauler like a crossover, but it provides ample room and great flexibility when cargo is the priority. 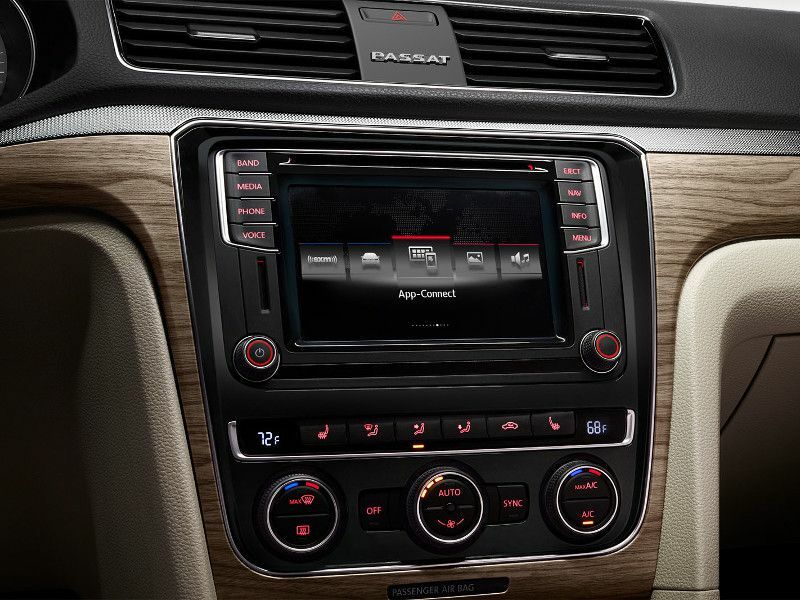 The base Passat has a 5-inch touchscreen with AM/FM/CD, one USB port, and Bluetooth connectivity. 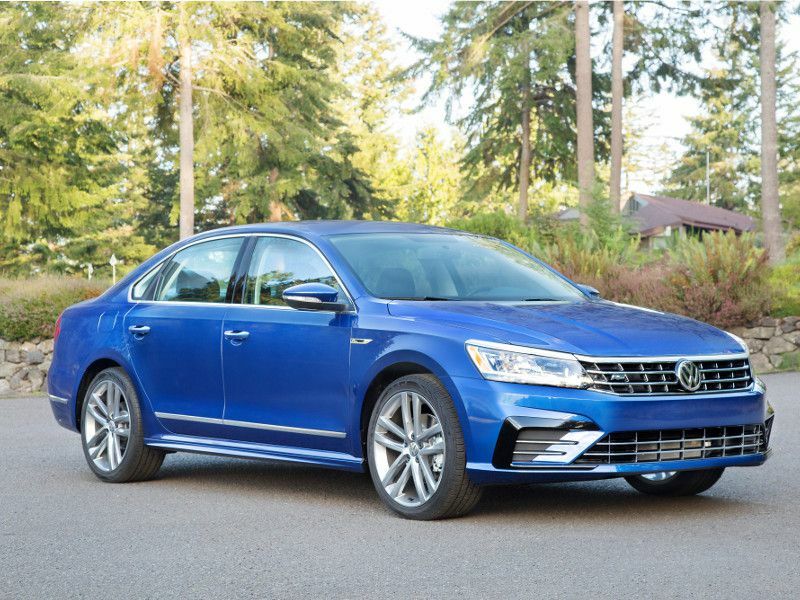 Every other trim has a larger 6.3-inch touchscreen with the addition of HD radio, SiriusXM satellite radio with a limited trial subscription, and VW Car-Net App-Connect. This allows for Apple CarPlay, Android Auto, and MirrorLink smartphone integration. Additional features available on top trims include navigation, a second USB port, Fender premium audio system, VW Car-Net Security & Service, and VW Car-Net Guide & Inform. The system is easy to learn and intuitive with buttons along the sides of the screen for commonly used functions. The drawback is the screen size, which is small even at 6.3 inches. 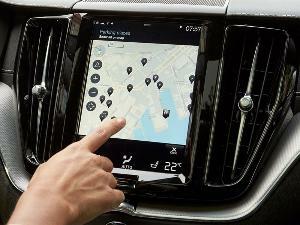 It’s also placed too low on the dashboard, which makes it challenging to see — especially if you’re shifting your eyes from the road frequently to follow the navigation system. The Passat comes with a good range of safety features and does well in crash tests. It was rated a 2017 Insurance Institute for Highway Safety Top Safety Pick, losing its former Top Safety Pick+ designation due to a Poor headlight rating. The National Highway Traffic Safety Administration also gave it high marks with an overall five stars in crash testing. 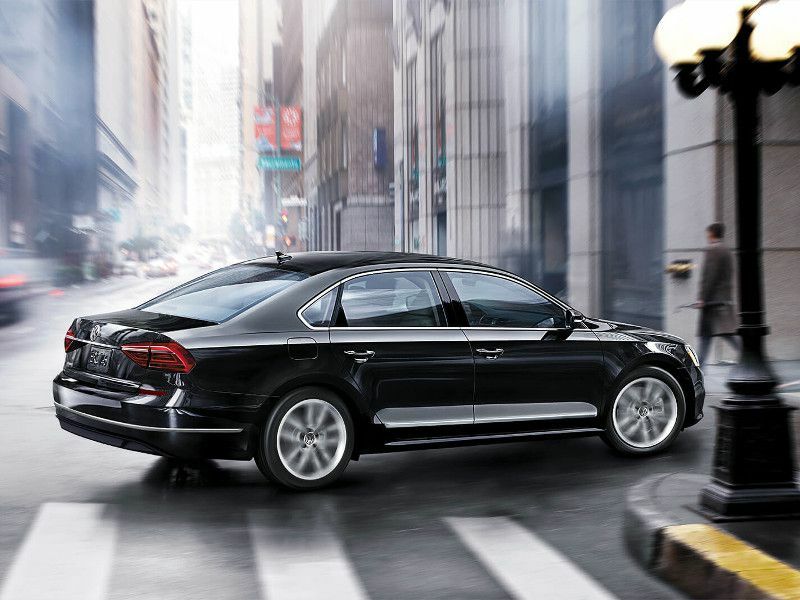 Standard on every Passat is a rearview camera, automatic post-collision braking, and multiple airbags. 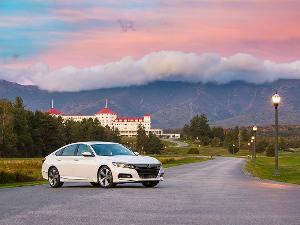 All but the base model also has adaptive cruise control, forward collision warning with autonomous emergency braking, and a blind-spot monitor with rear traffic alert. That’s all good, but if you want the most safety possible, it’s reserved only for the top two trims. These come standard with a lane departure warning, park distance control, and parking steering assistant. You can’t even get these as options on the rest of the Passat lineup. 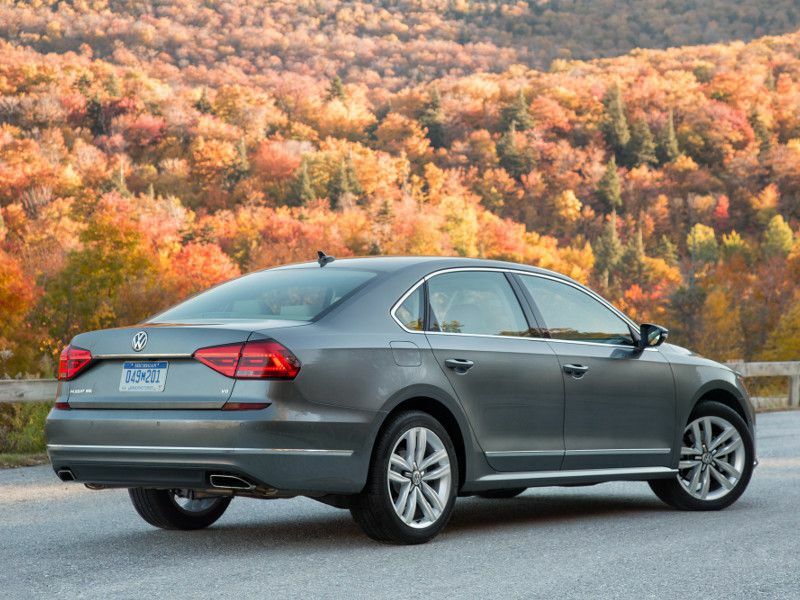 The Passat is a solid offering for those in need of an affordable mid-size sedan. Starting price on the base model is just over $20,000, and its new fuel-efficient engine makes it even more affordable over the long term. Top trims are less of a value as pricing edges over $30,000. The Passat gets strong marks for its roomy interior, particularly for those relegated to the rear seats. It also has an expansive trunk. This is a car that can easily handle everything a family needs for a weekend getaway or summer road trip. 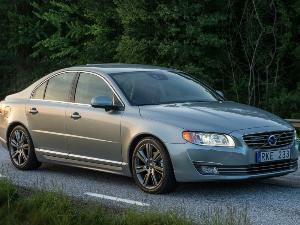 The drawback is its tame styling and modest interior. It’s not unattractive, but it blends in with other sedans rather than being a standout. Those who put a priority on affordability, safety, and roominess will appreciate what the 2018 Volkswagen Passat has to offer.